Hydrofracking operation is being performed these days at the Biliaivska-400 well. This well was drilled within the joint activities of Shell company (project operator) and State Company “Ukrgasvydobyvannia” (owner of special permit for the use of mineral resources) for exploration of tight sand gas resources. The well is directional (borehole is deviating from vertical straight line) and has a depth of 4 655 meters. The drilling of the well started in October 2012 and was completed in October 2013. Fracking operation has started at the end of November 2013 and will last during 20 days. Hydrofracking is performed at the horizon starting from 4080 meters and reaching the end of the well. It is planned to run from 7 to 10 fracking stages. The diameter of the borehole at this depth is 11,4 centimeters. 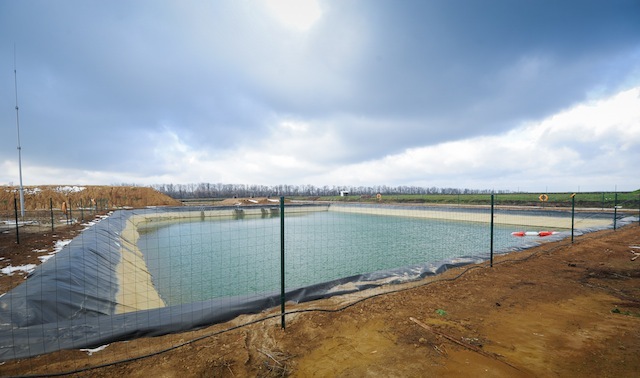 Reservoir for storage of water, which is used for fracking at Biliaivska-400 well. Photo of Shell’s PR office. According to the project design 5 130 cubic meters of water and 1 200 tonnes of proppant (synthetic proppant and sand) will be used for fracking operation. The share of chemicals in the hydrofracking fluid is about 1-2%. Overall, it is planned to use 15-16 different chemicals including 2 tonnes of guar gum. 80 persons work by shifts during fracking operation. 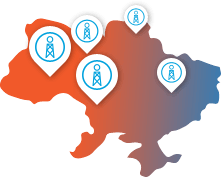 According to the Head of Well Testing Department of Shell in Ukraine Mr. Gert-Jan Bennekers, digital sensors providing real time information are employed during fracking operation. This allows specialists of the company to understand the way fractures are being formed, direction of the fractures and also to to take decisions on necessary changes to achieve better results. Visit of local activists and journalists to the well site. 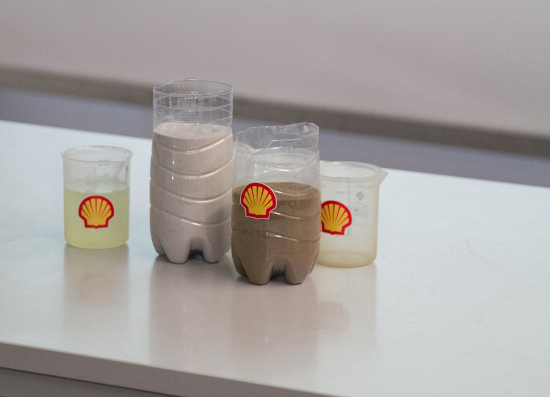 Photo of Shell’s PR office. 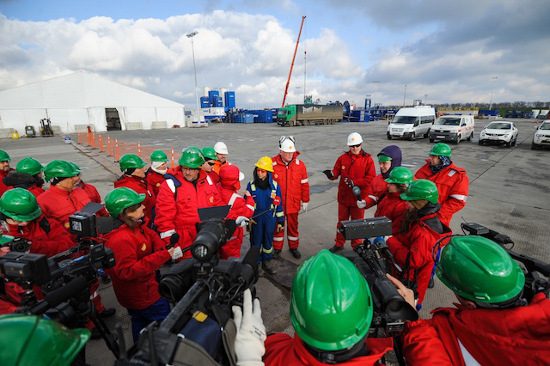 On 28 of November 2013 Shell has organised a visit of local activists and journalists to the Biliaivska-400 well site to present the fracking technology, which is used to stimulate the well. About 20 activists and journalists participated in the visit. 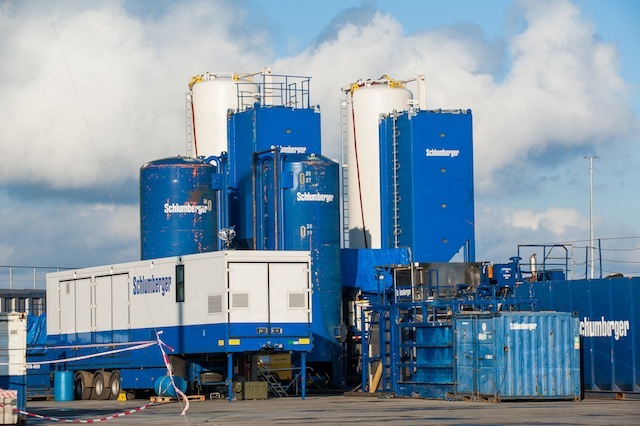 The fracking equipment was demonstrated to visitors and the technological aspects of fracking process were explained; however, due to safety reasons the fracking operation was not in process during the visit. According to Dmytro Bykov, who was among the visitors, at that time 2 stages of fracking were completed and the preparation for perforation of the well for third stage of the fracking was performed. According to the estimates and modelling done by specialists of Schlumberger company, which is carrying out fracking operation, the length of the fractures will be 75 meters and the width at the beginning will be 2-3 mm. By December 5 four stages of fracking operation have been completed and the preparation for the 5 stage is ongoing. 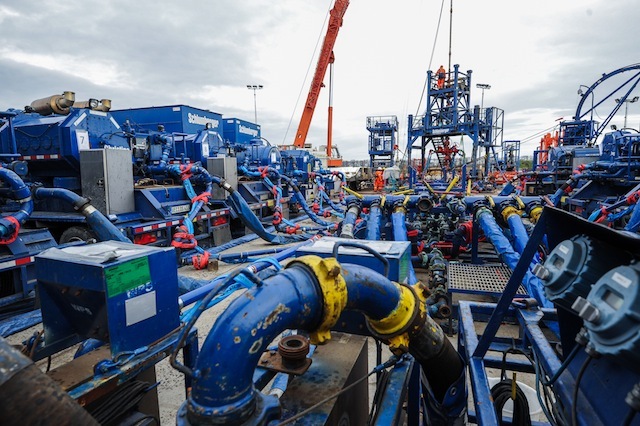 After the completion of the fracking operation the well will be tested during 90 days. During the testing period natural gas coming from the well will be flared. Simultaneously, the amount of natural gas will be recorded and the initial production rate of the well will be estimated. After the testing of the well it’s operation will be suspended for 6 months for pressure recovery.